Developed specifically for “Wine Bar Food” by Prosciutto di Parma Specialist Chef Tony and Cathy Mantuano, this recipe underlines the phrase – “quality over quantity.” The few ingredients that this prosciutto salad consists of are simple and easy-to-find. 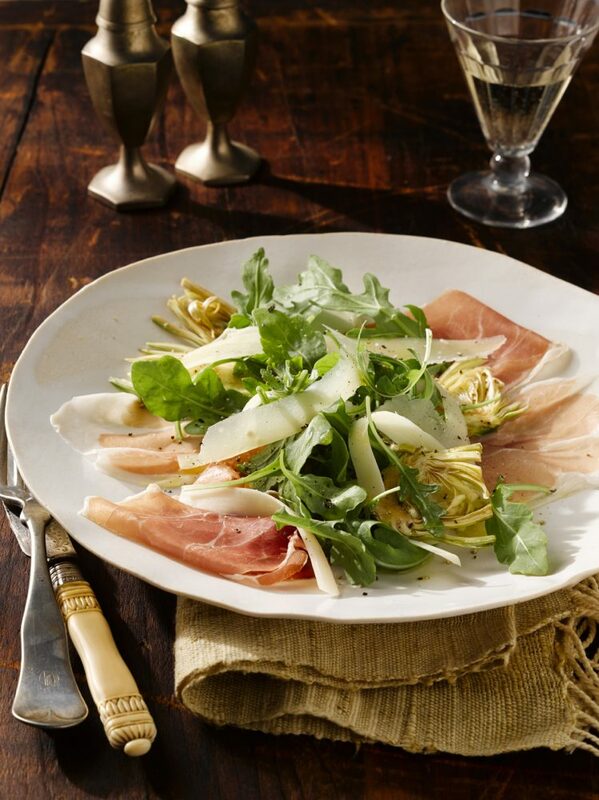 The artichokes and hearts of palm fit perfectly within the prosciutto salad, making it a great side dish or main entrée. Pair this one with a white wine like Pinot Grigio or a light Belgian wheat beer. See Prosciutto di Parma beer pairings here. In a medium bowl, squeeze 2 tablespoons of lemon juice, reserving lemon. Add salt and pepper and, in a slow stream, drizzle in olive oil, whisking constantly until the vinaigrette is well blended. Set aside. In a medium bowl, add cold water and squeeze any remaining juice from the lemon halves into the water. Add the lemon halves, too. Cut off all but 1 inch of the stem from each artichoke and then cut off the top fourth of each artichoke. Bend back and snap off the dark green outer leaves at the base until only the pale green and yellow leaves remain. Peel the stems with a vegetable peeler or paring knife to remove the tough outer layer. Cut each artichoke in half lengthwise. Using the point of a knife, remove any purple-tipped leaves and fuzzy choke from the center. Using a mandoline, or a very sharp knife, carefully shave the artichokes into thin slices, starting with the flat side of the artichoke. Place the artichoke slices in the lemon water. Using a mandoline or a very sharp knife, shave or thinly slice the heart of palm and then the Parmigiano cheese. Drain the artichokes and place on paper towels to dry. To serve, place 2 slices of prosciutto on each of 4 plates. Add the artichokes, heart of palm, cheese, and arugula to the bowl with the vinaigrette and toss to coat. Divide the mixture among the plates, placing a portion on top of the prosciutto. Offer freshly ground pepper at the table.